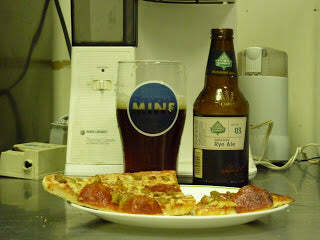 Last weekend I picked up Summit's new India-Style Rye Ale (IRA) and have to say that I'm impressed. ABV: 6.3 The first two beers in this series were a Kolsch and a Scottish 90 /-. I really liked the Kolsch. It's pretty rare to see a domestic example of the style (yeah, I know it's not REALLY a Kolsch unless it's made in Cologne), and an even bigger treat to taste one that's made well. My memory of the Scottish 90/- is a bit hazy, but I remember liking it. Mostly, I'm impressed that Summit has responded to the demand for more interesting craft-brews in an innovative and skillful way. This weekend I went out and bought a second six-pack and have been handing out IRA's to some friends, encouraging them to pick up a sixer for themselves. When you see this beer in a bar or a liquor store I'd urge you to buy some, not just because it's worth drinking, but because it's worth supporting a brewery that takes chances while maintaining balance.